There are numerous website selling Star Wars products BUT PartyBell.com sells officially licensed Star Wars merchandise. Be it Star Wars Costumes or Star Wars Party Supplies or Star Wars Costume Accessories we have all that too original merchandise. Darth Vader is the crucial character in the Star Wars trilogy.Vader is a ruthless henchman of Emperor Palpatine; he secretly intends to overthrow Palpatine to establish himself as ruler of the Empire. 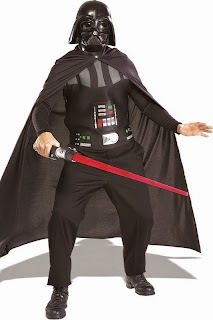 After his injuries received battling Obi-Wan Kenobi, Anakin Skywalker abandons his old name and becomes Darth Vader, the Emperor's right hand, and Dark Lord of the Sith. Darth Vader's iconic status has made the character a synonym for evil in popular culture. 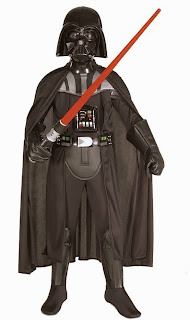 If you want to portray evil and ruthless character from Star Wars series Darth Vader Costume is perfect to go. 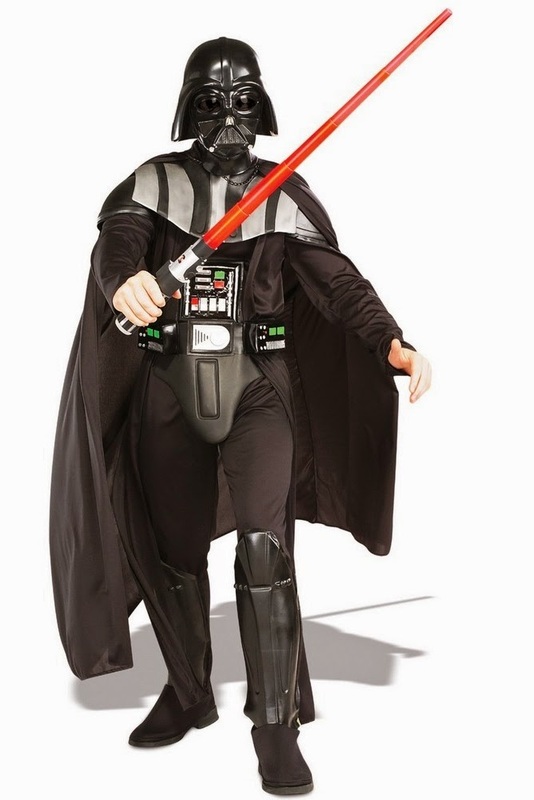 Description: Costume includes an injection molded Darth Vader face mask (front only, held on by an elastic strap), black fabric cape, printed jumpsuit with molded plastic collar, boot tops, and belt. Available in adult sizes: Standard and X-Large. Darth Vader's light saber, gloves, and breathing device sold separately. This is an officially licensed STAR WARS T Revenge of the Sith costume. For those who don’t want to spend on buying a costume, this Darth Vader Adult Costume Kit will solve your problem. Kit includes Mask, cape, chest piece and light saber. Pants and shoes not included. This is an officially licensed Star Wars product. Kids are fascinated by Aliens and other planet stories! Dressing them up in this Star Wars Darth Vader Costume will be fun for them and for you too. Description: Costume includes mask, cape, belt, jumpsuit, boot tops. Costume does not include Lightsaber, gauntlets or breathing device. This is an officially licensed STAR WARS T costume. Star Wars Clone Trooper is army of identical, genetically - modified clones, created to serve in the Grand. Clone Trooper formed the backbone of Republics. These Robotic Star Wars Clone Troopers can fight any one in the galaxy. 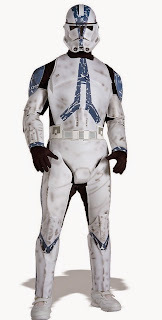 Description: Costume includes bodysuit with attached EVA plastic armor, and clone trooper 2-piece mask/helmet. Available in adult sizes: Standard and X-Large. This is an officially licensed STAR WARS Revenge of the Sith costume. Black gloves not included. Kids are fascinated by robots. 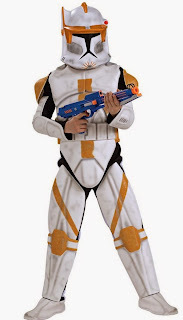 Dress them up in this Star Wars Clone Trooper Costume this Halloween for mechanic fun! Description: Costume includes Jumpsuit with body armor, belt and two-piece helmet. Toy weapon not included. This is an officially licensed Star Wars T costume. Material: Costume: 100% Polyester, Helmet: Plastic. 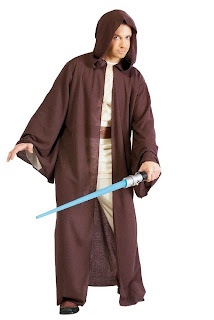 Description: This heavy weave, hooded Jedi robe is a perfect addition to any Anakin Skywalker or Jedi costume. This costume is available in adult size Standard. This is an officially licensed STAR WARS Revenge of the Sith costume. A daring pilot and a skilled warrior, Anakin's confidence is his greatest asset, and, at times, also his greatest liability. 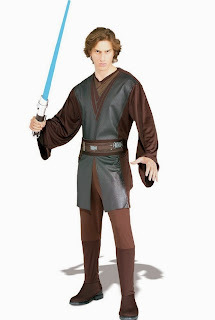 This Halloween dress up as Anakin Skywalker – skilled Star Wars Warrior and find your princess Senator Padmé Amidala. Description: Costume includes screen printed tunic with attached shirt, belt and pants with attached boot tops. This is an officially licensed Star WarsT costume. Description: This deluxe adult costume includes character mask, jumpsuit, robe and waist sash. Walking stick not included. This is an officially licensed STAR WARS costume. The manufacturer has changed the style of this product. The Mask is now slightly different than shown. It now stops just below the chin, and no longer covers the entire neck; and the style of the hair is different too. The color shade and markings of both the mask and the robe may vary slightly. 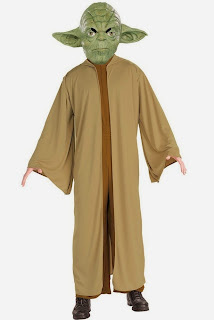 Star wars Yoda Costumes is perfect for your little one’s Halloween Part. Yoda being the size of a 5 year old kid will be perfect for your kid. 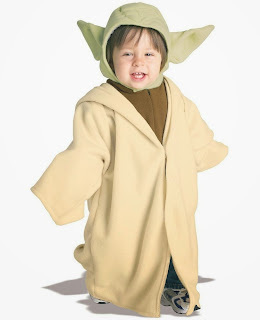 This Star Wars Yoda Fleece Infant Costume is tailor-made for your kid. Description: Includes headpiece and robe. Does not include shoes or jeans. This is an officially licensed STAR WARS T costume. Unlike other princess, she with poise has strength of a man. She fights for freedom, justice and peace. True depiction of strength a woman should have. Apt costume for you ladies if you want to show your power side this Halloween. Description: Includes: Top, briefs with skirt, belt, choker, arm band, hair clips, and headpiece. Earrings and shoes not included. This is an officially licensed Star Wars T costume. Description: Includes: Jumpsuit, boot tops, toy gun and belt. Boots not included. This is an officially licensed Star Wars costume.